Yamaha Silent Brass System for Trumpet The Silent Brass system lets you play your horn anywhere you want, anytime you want, with just the kind of ambience you want. 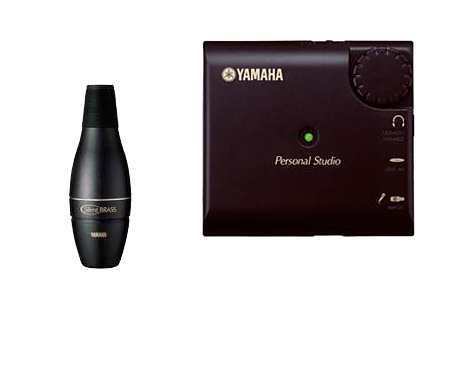 You can mix in the sounds of a CD player, a Silent Piano, an electronic keyboard or another instrument using the Silent Brass System, and output your playing to a recorder or even an amp with speakers. Never again will you have to search for a practice room or have to stop because it's getting late. The system includes the Silent Brass module, pickup mute, locking cable, belt-loop/strap, button earphones, and 9V battery. The Personal Studio module has been redesigned. It is sleeker, smaller, the sound quality has been improved, noise reduced, and the controls simplified.